Whether your main garage door spring has snapped or you need to get additional handheld transmitters to operate different door openers or want help replacing garage door panels crushed by a car, Genie of Fairview Door Co. is your one-stop shop for any maintenance needs. We specialize in garage door and garage door opener installation and repair services. And as an Angie’s List Super Service Award winner since 2009, we know what great service looks and feels like! Our locally-owned family business has been serving Cleveland over 50 years. Daily we work on and are knowledgeable about all major brands, including Genie, Liftmaster, Chamberlain, Sears Craftsman, Multicode, Stanley and more. Hiring us to repair or replace your garage door or garage door opener, you can rest assured that we’re exclusively dedicated to this field: It is our only business. Genie of Fairview’s services aren’t limited to the above products, either. 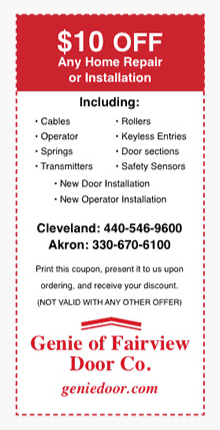 Homeowners throughout Cuyahoga, Medina and Summit counties can depend on Genie of Fairview Door Co. to find any garage door operator replacement part imaginable. If you’re not sure what you need or you’d like to see examples of what is available in terms of new garage doors, we invite you to stop by our showroom, located in Broadview Heights. We also offer installation and repair services for commercial door clients and builders. If you’ve decided it’s time to replace your bay doors, dock doors or rolling steel doors, or you simply need to add one to your facility, you should give us a call today. We’ll schedule an on-site appointment to come and meet with you to discuss your options. For more information on our installation and repair division, contact us today by calling 440-546-9600.